David Noonan rode the 75th winner of his career and lost his 3lb claim when partnering Mr Clarkson to win the feature £20,000 Betfred Hurdle Series Final for trainer David Pipe and owners Pipe's Prospectors. He had to work hard for his win as Bollin Ace proved a tough opponent and the pair had a real set-to up the straight with Mr Clarkson getting on top only after the last to win by a length and a quarter. Noonan, 21, who has been with Pipe for four years, said: "My horse showed a very willing attitude there. "I'm very proud that I've lost my claim on one trained by David [Pipe] as he's been very good to me. I would say my most memorable win was on Lily Waugh at Cheltenham in December 2015 - she was my first winner as a professional and it was also my first win on Channel 4. "Since I started I've made a lot of contacts and I'd like to thank everyone who's supported me." It was tough for the owners of Bollin Ace as he finished runner-up in the race for the second year in a row despite racing off a 22lb higher mark than in 2016. His trainer Tim Easterby said: "The winner is a very nice horse but we weren't helped by the handicapper putting our horse up 4lb for falling at Newcastle last time." 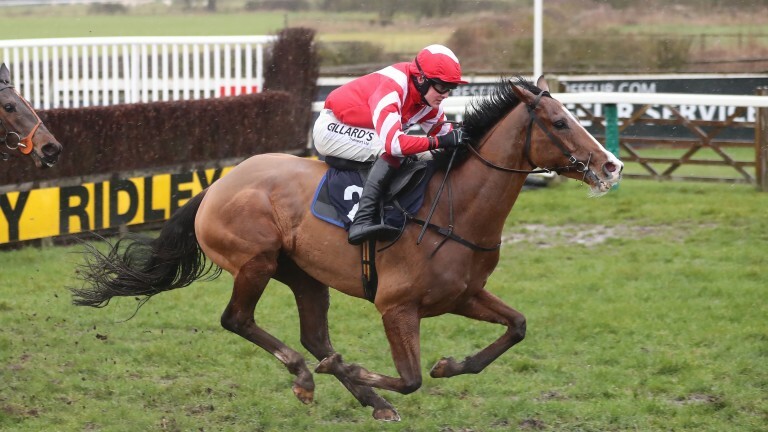 Sedgefield is the only British jumps course at which trainer Philip Hobbs has never had a winner, but he looked to have a fine chance of completing the full set with Little Miss Poet in the 2m1f mares' novice hurdle. Although a flop at 1-10 on her previous start at Exeter, she was sent off favourite at 11-10 to atone for that defeat, and with Richard Johnson having his only ride of the afternoon it looked an ideal opportunity. But she was second once more, this time proving no match for market rival Hint Of Grey. The winner, who runs in the colours of Catherine Reed, is trained by Don Cantillon, who said: "I'll probably give her one more run over hurdles and then she'll go back on the Flat." At this time last year trainer Ken Slack was carrying all before him as he racked up 23 winners in his first full season, many of them here. This year has proved tougher and Onwiththeparty's success in the 3m3f handicap hurdle was his 12th of the season and his first for seven weeks. He said: "I needed a winner. I've had quite a few who have suffered with injuries and also had a bug in the yard." James Clarkson, 11, received a warm reception after running a lap of the course after the penultimate race in aid of the Injured Jockeys Fund. He had already run around Southwell, Doncaster, Wetherby and Market Rasen, and headed off to Newcastle to complete an exhausting day. "He couldn't win for Paul Nicholls, he couldn't win for Chris Gordon, and I was mug enough to buy him" - trainer Ken Slack after Onwiththeparty won the 3m3f handicap hurdle. Although he ran well to finish second, Bollin Ace has suffered at the hands of the handicapper this season. Not only was he put up 4lb after falling at the last at Newcastle on his previous start, before that he had been raised 18lb for winning a four-runner novice hurdle here in which one had no chance, another broke a blood vessel and the only other runner had been beaten 25 lengths on his previous start and 30 lengths on his only subsequent outing.